Ian Harwood continues his popular series that takes a personal look back at speedway in the seventies. In 1973 ITV started taking a serious interest in the sport and there were a couple of legendary run-offs. Christopher saw his first meeting almost 50 years ago. Here he shares some memories from down the years. "1967, 3rd June, my neighbour took us back to Meadowbank, I had been before with him, August 1965, but being only 9/10 years old, was too busy making a pest of myself. Now I was wee bit older and wiser. The first thing that hit me was the smell, aroma, the riders starting up their bikes and 3 riders coming over to us stating something about gate 2 having a problem (nieghbour was a starting marshall) - Reidar, Douggie, and George Hunter. I was vey impressed my neighbour knew these people and they knew him, even more so after the racing was finished. 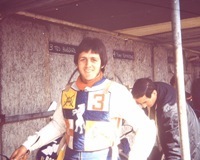 Ever since I have been addicted to speedway, there is no other sport as engrossing, long may it continue, Meadowbank so sorely missed, the atmosphere, crowds, mostly the racing and presentation." "I certainly remember Nelson stadium. In 1968 I went to support Belle Vue Colts at the venue. At that time the Aces second string were riding high, unbeaten and ultimately won the title that year. Travelling confidently we then found that the track was a little (?) different to what we had been used to seeing at Hyde Road! It was many years ago but I can still see the bricks sticking up on the corners now, and the away riders were suitably subdued as a result. Colts went down by 14 points, only Taffy Owen able to cope with the conditions.........he scored 13 pts from 5 rides." Philip Dalling was digging through his archives and found this picture of the main grandstand at Seedhill Stadium in Nelson. 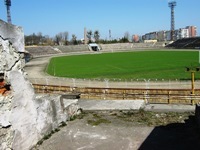 Further pictures of the L'Viv track in the Ukraine. An incredible amount of concrete was used during the construction but much of it is now crumbling. These pictures are courtesy of Ian Presslie. Congratulations to Tai Woffinden on winning BT Sport's Minority Sports Person of the Year award. A great end to an incredible year for the Scunny lad. "Very interesting. Jonny Roccio is my Grandfather and Ernie Roccio is my great uncle. As they, and many of their friends have long passed, information has been difficult to obtain about their racing careers. If anyone has any information or photos I would be exptremely appreciative if we could get in contact. 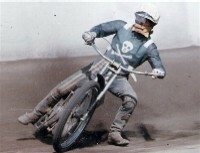 Email: broc311@gmail.com"
" Buster Brown left Wembley to join Swindon Robins c1952 where he became a popular heatleader." "Never had any steel girders the track was on wooden posts with tyres to cushion the fence, unlike the main track today!" "Wilmslow Hammers 48 Belle Vue 48; SUN 28 April 1962; Hammers in photo and points scored: A Lewis1, J Percival 5, P Lomas (capt) 13, C Brecknell 1, R Holllins 5, M Page7, J Mottershead 9, J Wright 2, A Willcocks 3, M.Lees 2. To make the match more interesting Wilmslow took all outside gates. Harry Marsh did not ride in this meeting, he retired from racing in 1957." This circuit is situated in Central Finland, about 350 kilometers south of the Arctic Circle. There are two tracks, the full size track for 500 cc racing and a smaller track inside the larger track, used by juniors using 80 cc bikes. The track record is 61.56 seconds held by Kai Laukkanen (2005-07-16). There is only one meeting, over a weekend, here each year, around the third week of July each year. It is the Finnish Kaupunki Cup, which seems to be a pairs meeting between Finnish tracks. Thanks to John Middlemiss for the photographs and this information. Andrew has been a Coventry Bees fan for 35 years, here he selects his favourite seven riders of all time. Emma Romaine is looking for old pictures of Saddlebow Road (King's Lynn) for her website - Can You Help? Sylvia Wheeler's father was mechanic for Riskit Riley and would like to know more about the rider - Can You Help? "If you have a friend like Danny you don't need any more, he will be in the hearts of his friends forever. Rest in peace mate." "Great article - brought back lots of memories, as '72 was the year I started getting into speedway more seriously." "Please can I assure Martin Wilkins that I bear Norman Strachan no malice whatsoever. These are my reflections on my memories from being a child. I have nothing but admiration for anyone that hurls themselves sideways round a speedway track on a motorcycle with no brakes." 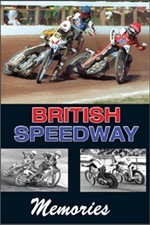 A new book from Retro Speedway that collates the memories of fans, riders and officials into a book that looks back over all of British Speedway history. Snapshots taken in the pits atRye House and White City in the 70s. The photographer was 'Handy Andy' Davidson. "I followed Wimbledon from 1960 until its closure, my favourite rider was Ronnie Moore. I always thought Gary Everitt would come good, such a sad loss to the sport. I miss speedway now, no clubs close to my home in Sutton." "I was Mike Howe's mechanic, he was signed to Milton Keynes, who went bust then would only loan him. This contract effectively meant that he would have to be purchased or transfered and cost money. He was on loan to Belle Vue and Peterborough that season. Peterborough decided they no longer required his services, then he could not get another ride. I know that he was under pressure from his day job, his parents,and finacially from the costs of racing, the time he was putting in. I guess he had done his part, turned up, nice bikes, rode well, shown promise, commitment and still could not get a ride. I know I am biased but the guy had talent and the politics of a sport and its promoters robbed him of a chance. I know that Lee Coleman broke or cracked his neck in a practice at Peterborough and retired." " I would think that the riders would not even notice the start line girls when racing, noticing the girls Before the meeting... yes.....and after the meeting ....oh yes." "Reading this reminded me of every meeting I attended as a youngster, although I started watching Newcastle Diamonds in 1975 and my 1st world final was 1978. I look forward to your next chapter." "An excellent look back at the late 60's / early 70's. I was a West Ham fan then, and ultimately Hackney, but did lots of away trips with the Hawks, the Belle Vue one being of prime importance. What great days, never to be relived sadly, but happy memories nonetheless." "Oh man, I'm lovin this !!!" "I do enjoy these articles, however I do find the constant jibes about Norman Strachan a little distasteful. Norman came to my club Newport in 1968, although never a world beater was a solid 6 point second string . 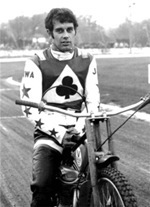 However in 1969 he was averaging over 8 a match and riding the best speedway of his career. Until a match with Sheffield when Arnold Haley clashed with him at Newport, a really nasty crash. Norman was out for a while but when he came back sadly was never quite the same and maybe went on racing longer than he should have, in my view Haley left a legacy on Norman. So I would ask the writer not to be so damning of Norman when he never seen him at his best on another track." "I remember attending a Golden Greats meeting at Coventry with both my parents. Ken McKinlay got on a bike for a ride round. A couple of match races involving PC were great entertainment. I even have some photo's of the day and I think the programme hidden away somewhere. I also attended the World Final at Odsal and was glad I took my camera as I have some good photo's to look back on with fond memories." The next chapter in Ian Harwood's popular series in which he takes a very personal look back at his formative speedway experiences. Watching Peter Collins and Ivan Mauger each week wasn't a bad way to spend a childhood! 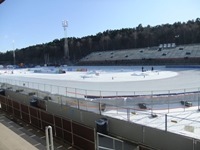 Ice track pictures this week of Uppsala in Sweden. These are courtesy of Gillian Marks who took in a meeting during 2012. 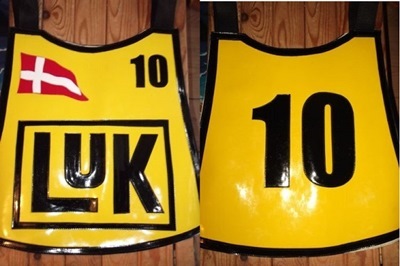 Rasmus Terkelsen would like to know about the history of this race bib - Can You Help? Sarah Sinclair is looking for someone who remembers pre-war rider Arthur Warwick - Can You Help? "Great article! I am just so sick and tired of the sexism that is in speedway and almost all motorsport. How are we going to get women into the sport if we give them the impression that they are only objects of male desire? I watch a lot of speedway with my girlfriend but she hates watching the GP's and The SEC, it makes her just so sad and that's probably what a lot of women feel. It's just horrible the way it is right now." "Re: Harry Marsh 'Pedalling to Glory': His father Frank Marsh was a highly respected midget car driver 1934-39 and linked to the Elto midget cars which were then being promoted by then Belle Vue speedway promoter the legendary E O Spence. Many of the Belle Vue midget car drivers were also speedway riders. There is much about Frank Marsh on the internet - he even has his own page. This can be found by a Google search Frank Marsh midget car racing." "Glad to hear you enoyed your visit Tommy but please note (though in the town of Sittingbourne) the track is called Kent Speedway - this is because the track in Iwade has the 'Sittingbourne' name... I appreciate a bit confusing but it is important NOT to call Central Park, 'Sittingbourne'..."
"Richard, I was there for the first ever meeting this year, it was great, well over 3000 people, such a great event, the track did cut up a lot but its since been fixed. Regards, Martin"
"Knew him when he was a kid riding a mac 101 minibike in the 125cc class at Elsinore for his early mentor Ron Stewert. Knew him when he hit So Cal Speedway tracks and after his racing days. Kept wanting to get back up to OC and look him up. Sorry I didn't do so. Godspeed Danny."